Apparently, only those who were weak and poverty stricken were worthy of “gods” words. This is a subliminal message and instruction to favor the weak traits over the strong, something islam preaches throughout. It is blatantly obvious what the purpose of teachings such as these are and the affect that they have, and that is to weaken and enslave the minds of all who are deluded into believing them. These teachings are suicidal and in direct conflict with civilization. If every person in the world were to believe that weakness, poverty and slavery were virtues to be sought after, we would have no leaders, no great thinkers and teachers, no explorers discovering new lands, no genius making great advances in technology and science, no inspiration and no civilization. Civilization was created by those who had the drive to create beauty and order and at the same time maintain Liberation of the People. The Islamic teachings contradict this at every step and glorify the exact opposite. The very word islam translates as “submission”, or in its longer version, “total submission to god”, which is the foundation of what this program demands. Here is a quote from an islamic website, “islam city” that illustrates this nicely: “By uttering “the Shahadah”, they confirm their faith in the Oneness of God and declare their total submission to His Commandments, as revealed to His last Prophet, Muhammad”. It is no secret that this is what islam is all about. What people need to realize is the truth about WHY this is what islam is all about, and why this program demands it. The reason is to enslave humanity, Spiritually and Physically. The entire program of islam is a LIE through and through. It must be remembered here as well that the “god” that islam and its qur’an speak of is not the divine, omnipresent being floating above the clouds that those deluded into its lies believe, but a PROGRAM designed to control and enslave humanity. The islamic god, who is the same as the christian god, DOES NOT EXIST. There is a ton of proof for this. The site http://www.exposingchristianity.com by High Priestess Maxine Dietrich explains this fully. The word submission usually has a very negative connotation in anyone’s mind, and it should be no different when it comes to islam. To submit to something means to give yourself over to it entirely and give it full control over your mind, your body and your life. You cannot submit to someone or something and still be an independent individual. You replace your own individual personality, life and will with the will of that to which you are submitting. This would immediately cause alarm bells to ring in the mind of any sane and logically thinking person. However, unfortunately, islam has deluded and corrupted the minds of thousands of people. Forcing and deluding people into submitting is making slaves out of them both Spiritually and Physically. True Spirituality is about Liberation. There is *nothing* Spiritual about islam, it is a program, and the very name itself, “submission”, is undeniable proof of this fact. Isn’t submission the direct opposite of being a Liberated and Independent Individual? Islam is working to dis empower the individual , placing the power instead which is the individuals birth right as was given to the Gentile People by the TRUE Creator God Satan/Enki/Iblis, into the hands of this so-called “god” of the quran. Being mislead into the belief that this is what is right and healthy for them, the people give themselves up willingly and unknowingly feed this “god”/program with power that is keeping it going, in turn, keeping the people enslaved. It is a vicious circle that has to be brought to an end. The power that this program gathers is then used to control, manipulate and enslave the minds of the people who have now been severely weakened, exactly as it is used in christianity. Eventually, a mass slave state is created through which this god/program can work. Look at the criteria for a perfect slave: They do not question, do not think for themselves, do not think twice about submitting to their masters will and demands. This is exactly what islam needs of its followers and what it works to create within them. This is necessary for its purpose of enslavement and eventual destruction, and this is the reason why it is a program of total submission. “The five-time prayers become obligatory from the moment a person embraces Islam.”- taken from the previously mentioned site. The people do not worship out of their own free will, or any feelings of love for their god, but because they feel that they have to. They have the fear of eternal damnation within them if they do not, and the bribery of paradise if they do, both of which were NOT present in our Original Religion of Ancient Paganism. Any so-called “religion” that needs to rely on the crutches of fear and bribery is false through and through. 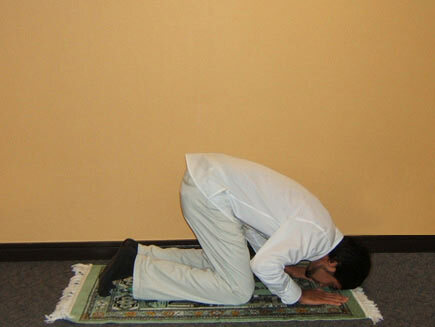 The muslim people are forced to bow down and worship no less than five times a day. This they do to a supposed god that does nothing other than dehumanize them, stripping them of their individual rights , individual lives, individual power and independence which are, or should be, natural birth rights. The islamic “prayer” is known in Arabic as “Salaat” and is a long and drawn out process that is preceded by ritualistic bathing and “cleansing”. Each is performed at a specific time of day. The first begins between dawn and sunrise, the second after midday, the third at mid afternoon, the fourth at sunset and the fifth an hour after sunset. The times are mapped out specifically according to the movements of the Sun. What muslims are unaware of is that this is blatantly STOLEN from Yoga and Meditation Practices, which have their origin in the Far East and which predate it by thousands of years. Yoga and Meditation workings follow the positions of the Sun and other Planetary Bodies, as there are those times of the day where Energy Work will be most powerful and effective due to the positioning of the planetary bodies. These have a profound affect on our workings, as is described in Astrology. A good example is the Yoga Sun Salutation which is usually performed at sunrise, midday and sunset. It is from these Spiritual Teachings and Concepts that islam STOLE its timings and repetitions of the “prayers”. It is blatantly obvious how these were stolen and corrupted. 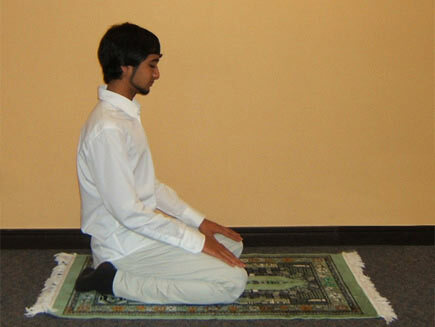 The qur’an also instructs a combination of “standing, sitting and prostrating” positions which is yet another stolen aspect. Yoga teaches that for a truly Powerful session, your body should be exposed to a combination of standing, sitting and lying positions in order to direct Energy differently through your body and Soul. As well as this, the islamic “ritualistic cleansings” are also rip offs of Ancient Pagan Practice of cleansing and purifying the Soul before workings were performed. The true meaning of cleansing and purifying is the cleansing and purifying of the Soul from the dross and “dirt” that attaches to it over time. It is important to begin Meditations with Cleansing the Aura and Chakras to get rid of this “dirt” or negative Energy. Islam removes the Spiritual side of this totally and replaces it with something completely material, ridding it of any true purpose, meaning and benefit. Any negative energies in the persons Aura/Chakras and Soul are left to accumulate and again they become weaker and weaker. This has resulted in the Spiritual degeneration of humanity as a whole as well as in disease, ignorance and poverty. But then, these are the things that islam glorifies. The islamic “prayer mats” are also stolen from Yoga Mats. Whereas today Yoga Mats are mainly used for comfort, to the Ancients they were more than that and were considered sacred. They were often made from animal skin, such as that of a Tiger for symbolism and decorated with various sacred, Alchemical Symbols. Islam blatantly took this concept from the Ancient Yoga practices, using it to gain power for itself. No true God that can lay claim to any true power demands and needs the worship of Humans. This in itself is proof of the fact that the islamic “god” is not a god but a program. It does *need* the worship of thousands of people, as this is the energy that feeds it. It depends on this energy in order to survive. Essentially, it is parasitic. It is obvious this is no god. The people are fooled into believing that worshiping this thing is going to get them a ticket to “paradise”. This bribery totally eliminates any possibility of free will. A person bribed into doing something is not doing it because they want to, they are doing it because they believe they will get something from it. If they had no incentive, no reward, they would not give it the time of day. Once again, this proves islam is not a religion, but a program. The fact of the matter is that islam always has been and always will be nothing more than a program of submission and slavery, designed to prepare the followers for enslavement and eventual destruction. It works to create a state of sheep-like followers where questioning , thinking for ones self and maintaining and individual personality outside of the program they submit to is literally non-existent. It is a system of the disempowerment of the People, and empowerment of the program. What they are fooled into worshiping is in fact their own damnation. It is a sick and twisted enemy doctrine that contradicts everything that is natural to us as Gentiles in every way and must be brought to an end! It has enslaved thousands of people, and this slave state must be broken.